Hello love ones, I'm going for a little different in this review so I will be having dual language on this review. This is my first post in dual language so do let me know your thoughts about this~ Remember to read till the end~ There will be a giveaway for all the readers! I'm going to share my little experience on having a Platinum Purified Therapy at esmé Clinic. Platinum Purified Therapy is able to dissolve the heavy metals within the epidermis that will cause skin sensitive, acne, rough skin and other skin problems. The therapy is also suitable for those who have backache. The toxins hidden in the body can be removed through this therapy and resulting in a healthier skin. Here's a overview on Platinum Purified Therapy. My face was cleansed with Apple Cleanser. The active ingredients in the cleanser helps to eliminate the dead skin cells and protect the surface of the skin from free radical damage. The cleanser has fine granules in it and is used as a scrub too. Always remember to clean the dirts at the side of the nose as people tend to forget the dirts love to hide at some hidden areas. As a small reminder here, choose the scrub with fine granuales so the skin will not easily get hurt with its roughness. The important feature of Platinum Purified Therapy is applying Purification Superconducting Capsules onto the cleansed skin and using a massager to do its wonders. This uses a high quantum technology that can quickly penetrate the active ingredients onto the skin cells. These active ingredients will help to get rid of the deposited years of lead, mercury, heavy metals that cause skin problems such as redness and sensitive. This method will improve skin texture and replenish skin moisture, enhancing the skin's immune function through discharge the unwanted dirts. I was told that the massage needs about 15 minutes on the whole face. Throughout the 15 minutes, the time spent on both cheeks will be longer than other areas. I felt a little warm on the cheek as the massage went longer on the face for quite some time however, it did not hurt my skin at all. The dirts that was hidden under the skin for years. My skin was not that healthy due to the hidden dirts in the skin. 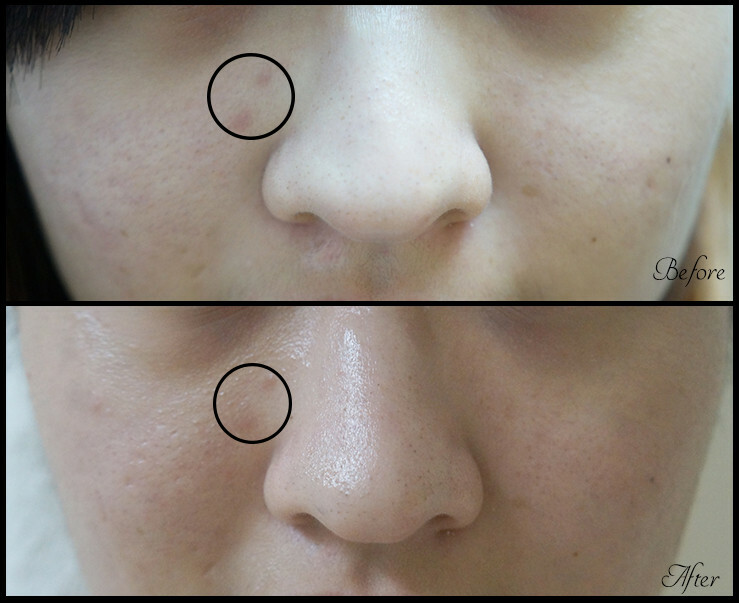 After cleaning off the dirts on face, Purification Collagen Essence and Purification Fountain Essence were put on the skin. The Purified Collagen Essence was mixed with Purified Fountain Essence for a lymphatic drainage massage on the face for 10 to 15 minutes. The mixture is rich in Hyaluronic Acid and has the strong ability to penetrate into the skin in order to rebuild the tissue collagen and elastin. The Fiber in Collagen Essence helps to lock moisture and reduce skin aging process. On the other hand, the Fountain Essence has trace elements that can keep the skin soft, smoother and free from radicals. 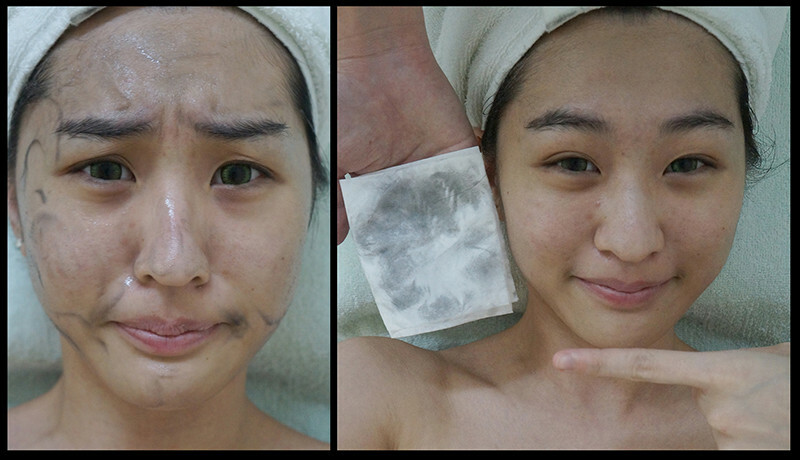 Platinum Mask is the very last step in Platinum Purified Therapy. It is recommended to be placed on the face for 35 - 40 minutes. The active ingredients is white fungus that can enhanced skin moisturising effects and improve water retention capacity. The white fungus also improves the skin condition and reduce skin facial wrinkles. Bonus picture of le face after Platinum Purified Therapy. The doctor was very patient to explain my doubts on different types of aesthetic treatments available in esmé Clinic. Enough of the babble and here's the time for you to get freebies! * Like esmé Clinic Facebook page get FREE V-Line Lifting Treatment for free.